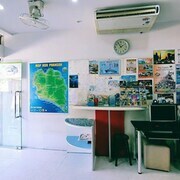 Situated in Koh Phangan, this hostel is within a 5-minute walk of Haad Rin Pier and Haad Rin Nok Beach. Haad Yuan Beach is 0.8 mi (1.2 km) away. We got upgraded for free to one of the sea view rooms, it was beautiful! The staff couldn’t help enough. All I could complain about was the water pressure in the shower was terrible, it pretty much dribbled water rather than a proper shower. Where to find Haad Rin hotels near an airport? Where can I find hotels in Haad Rin that are near tourist attractions? If you're planning a Koh Samui dream holiday, you will find a wide selection of comfortable hotel and apartment options in Haad Rin. Expedia's comprehensive database lists 22 hotels within a 6-mile (10-kilometer) distance of Haad Rin's town center. 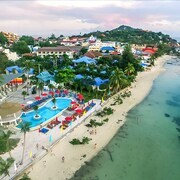 The Cocohut Beach Resort & Spa and The Coast Resort are some of the more centrally located lodgings in Haad Rin. 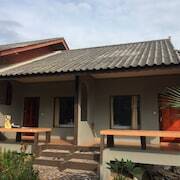 The W Retreat Koh Samui is located 8 miles (13 kilometers) away from the middle of Haad Rin. Another alternative is the Banyan Tree Samui, which is situated 14 miles (23 kilometers) away. 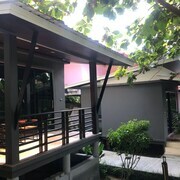 The Vana Belle, A Luxury Collection Resort as well as the Six Senses Samui are two other Expedia-listed hotels in Haad Rin. The larger Surat Thani region is definitely well worth exploring also. Surat Thani is marked by beaches and coastal plains, and common Surat Thani destinations include ruins. Travelers in this part of Thailand often enjoy zip-lining. 5 miles (8 kilometers) from Haad Rin you'll find Koh Phangan, where you can spend the day enjoying Haad Rin Nai Beach, Full Moon Beach and Haad Yuan Beach. If you'd like to spend a night or two in Koh Phangan, check Expedia's booking pages for the latest deals at the Panviman Resort, Koh Phangan and Chantaramas Resort and Spa. Or stay in Koh Samui, 12 miles (19 kilometers) to the north of Haad Rin, where you can choose from the Zara Beach Resort and Best Western Samui Bayview Resort & Spa. The Fishermans Village, Hin Ta and Hin Yai and Bangkok Hospital Samui are a couple of the popular points of interest to check out when visiting Koh Samui. Koh Tao is the nearest economic hub to Haad Rin. It has plenty of shops and hotels, including the Jamahkiri Resort & Spa and Charm Churee Village. Tourist attractions in and around Koh Tao include the Ko Nang Yuan, Shark Island and Mae Haad Pier. Travel 35 miles (56 kilometers) from Haad Rin to reach Koh Tao. Just because you are on vacation, doesn't mean you can't indulge in your love of sport. Chaweng Thai Boxing Stadium can be found 10 miles (16 kilometers) to the north of Haad Rin. For visitors who are interested in sleeping nearby, make a reservation in the Vana Belle, A Luxury Collection Resort or The Library. Samui Airport is the most commonly used airport and can be found 8 miles (13 kilometers) away from Haad Rin. Conveniently located hotel options are Vana Belle, A Luxury Collection Resort and Six Senses Samui. 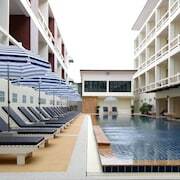 What are the most popular Haad Rin hotels? Are there hotels in other cities near Haad Rin? 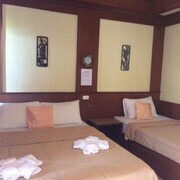 What other types of accommodations are available in Haad Rin? Explore Haad Rin with Expedia.ca’s Travel Guides to find the best flights, cars, holiday packages and more!